OSWEGO, NY – At 7:30 p.m. on June 28, Friends of Fort Ontario will host a guided tour of the Post Cemetery at Fort Ontario State Historic Site. Jennifer Emmons, curatorial assistant at the fort, will lead the tour of the Post Cemetery which will begin at the overlook parking lot. A donation of $5 would be appreciated. The tour is not recommended for small children. The Fort Ontario Cemetery holds the remains of 77 men, women, and children who lived, served, and died at the old army post from the French and Indian War to World War II. Jennifer, assisted by fort staff and Friends volunteers, will discuss the lives and deaths of those buried in the cemetery, as well as the history of the cemetery itself. 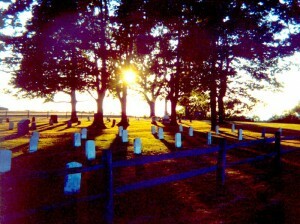 The Post Cemetery is situated in the parking lot overlooking the lake. For more information, call 315-343-4711. I LOVE these little tidbits of history. Thank you for offering this to the community, Jenny! How MANY times have I walked those grounds, and now I will know more about the soldiers buried there. Yeah! Awww r u going to do it again soon? Im very interested.